Here’s an understatement for the year ahead: The workplace is changing and engagement strategies are changing along with it. Anyone involved in employee engagement knows that conventional wisdom has been turned on its head by a newly plugged-in and charged-up generation of workers. 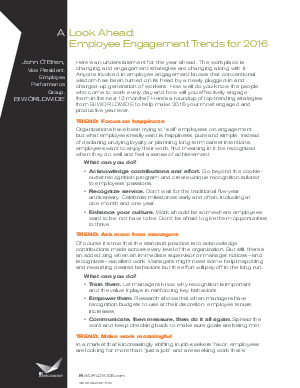 How well do you know the people who come to work every day and how will you effectively engage them in the next 12 months?